The first weekend of the fourth month of the year unites us all with exceptional birding opportunities. Did you join the party? I found myself in fine company on the hawk watch platform at Braddock Bay, where streaming flocks of Turkey Vultures were infiltrated by a variety of hawk species. I was most pleased to pick up Rough-legged Hawk, which I hadn’t yet been able to track down this year. Corey got out and about this weekend a bit but, as always in early April, his aspirations were ahead of the season and he didn’t see many exciting new migrants. Of those he did see he was most enamored of a nice Pine Warbler singing its heart out at Baisley Pond Park. 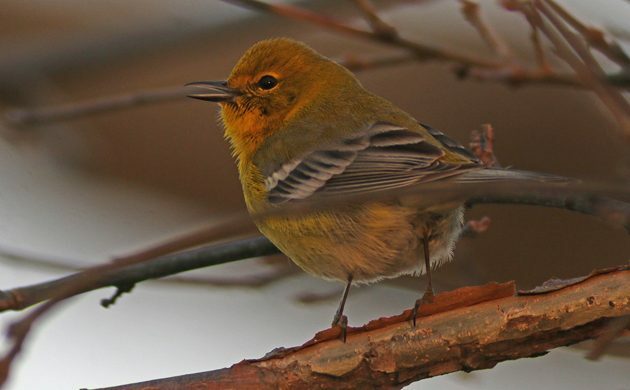 That Pine Warbler is Corey’s choice for his Best Bird of the Weekend.